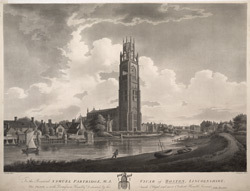 North west view of Boston Church in Lincolnshire, eastern England. The church is dedicated to St Botolph and it is thought that the city’s name ‘Boston’, is a corruption of the saints name. It is one of the largest parish churches in England and measures approximately 282 feet long by 98 feet wide. Standing to a height of 272 feet St Botolph’s has one of the highest church towers in England and it is known as the Boston Stump. It is believed that the church was built on the site of a monastery founded by Botolph in the 7th century. Building work began in 1309; however it was not completed until 1450, the tower being the last portion to be built. A 17th-century vicar of St Botolph’s, John Cotton, was one of the leaders of the Pilgrim Fathers who founded Boston, Massachusetts, in America.